With Codemasters 2012 iteration of F1 just around the corner, a demo was released on Xbox Live Monday, PSN and PC Tuesday so sit down and buckle up for our F1 2012 preview . I spent some time with the Xbox version of the demo and am very pleased on how it seems to be shaping up. The demo starts you off on a “Young Drivers” weekend, where your skills as a driver are tested to see how your settings should be set. New to the F1 titles? Then crank up your assists! A veteran? Who needs assists? Don’t worry if you’re in the middle like me, you can tweak the settings to your liking. The first question asked is how familiar you are with the series, so it’s pretty good at getting you in your sweet spot right off the get go. Once your done with settings, your name and country, you will be thrown on the paddock where you will meet your engineers who will help you through your F1 racing career. Here you will be thrown into some different events to familiarize yourself with the controls and even help you learn the basics of F1 if you are new to the genre. Drive in a straight line as fast as you can and stop in the targeted area, then watch a video on how the KERS system and DRS work. No clue what I’m talking about? Don’t worry it’s very good in the videos to explain how these mechanics work, and when to use them. Alright, let’s get to the good stuff, the gameplay. Codemasters have done wonders on their driving engine. The cars feel great, responsive and so fast. The sense of speed you get when you throw one of these cars around a corner and you think to yourself “why am I sticking this corner going this speed? I should be in the wall!” and you don’t, just goes to show how perfect they have nailed the physics and aerodynamics with these cars. F1 cars are technical showpieces and you get this when you drive around the course in one. Another great addition this year is random failures. Whether it’s a tire puncture, or failure of KERS or DRS, this adds another layer of realism to the game which makes every lap just that more nerve racking! Visually everything looks great. From the details of the cars themselves, to the tracks, and even the environments. Great detail has been put forth to wrap you up in living the f1 dream. All the teams and their cars from the 2012 season have been included, as well as all the tracks, including the new Abu Dhabi track. You’ll get the chance in the demo to check out this track for yourself, and it’s amazing how good it looks in motion. The other track you’ll get to sample is Monza, in a mode called “season challenge” which makes you choose a rival, then places you in a mini season of sorts where you are in a ten race season. Each race consists of 5 laps. Your goal is to beat your rival, and climb up the standings in the mini-season. With more than a few races under my belt, I’m pretty confident that Codemasters is heading in the right direction with this years iteration. I can’t wait to see more with this title as I am eagerly awaiting its arrival. 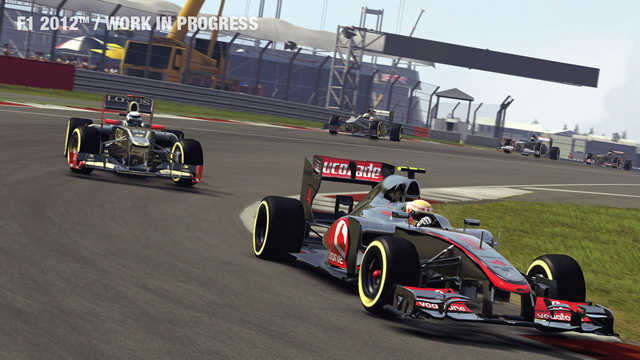 F1 2012 releases on September 18th, 2012.